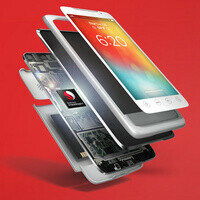 The MSM8226 and its CDMA counterpart – the MSM8626, are the newest members of Qualcomm's expansive Snapdragon S4 family of chipsets. Both chips feature quad-core CPUs and are made using 28nm manufacturing process, combining adequate performance without sacrificing battery life. Graphics are being handled by an Adreno 305GPU, which supports video playback and recording at up to 1080p, and up to 13 megapixel cameras. What's also worth noting is that the MSM8226 and MSM8626 come with the new WTR2605 multi-mode radio by Qualcomm, which is tailored to work with Chinese TD-SCDMA networks. Support for location tracking via GPS, GLONASS, and BeiDou is also on board. Its maker points out that the WTR2605 is 40% more efficient and 60% smaller than its previous transceiver generation. Both SoCs can work with two active SIM cards at the same time. Samples of the MSM8226 and MSM8626 will be ready to ship to interested manufacturers by the second quarter of 2013. Chances are that we'll see them in use with smartphones targeted at "budget-conscious" consumers. Two words for you: MSM8625Q and MSM8225Q Quad core S4 with A5 cortex courtesy of Qualcomm S4 "Play"
Krait looks old now, A15 is destroying it and if Qualcomm does not license A15 or have something better then it may have troubles. FYI Qualcomm doesn't use the standard Cortex-A series core design. They have their own core proprietary designs. Qualcomm MSM7627, MSM7227, MSM7625, MSM7225 S1 are ARM 11 Qualcomm MSM7627A, MSM7227A, MSM7625A, MSM7225A ARM S1 are cortex A5 S2, S3 are Scorpion S4 Prime, Pro & Plus are Krait S4 Play are cortex A5 (for now) I suspect these two quad cores will be A7 to compete against the announced MediaTek MT6589 in the cheap markets. But Qualcomm is remaining silent on the cores, probably because they want to sell a "cheap" quad core even if it doesn´t make any sense. You can read my full runt against these kind of chips for their low "single thread performance" in the comments here:http://www.phonearena.com/news/Sony-may-launch-cheap-quad-core-Android-smartphones-in-2013-testing-chips-by-MediaTek_id37239 Just for your information: Qualcomm DOES NOT ALWAYS use there own core designs. No, S4 Play are not, read my previous comment. Ofcourse, tegra 4 will destroy it when ti comes to cpu power, as well exynos 5440. Both are A15 and clocked at higher frequencies. Yes Krait will be destroyed but it will still be a good SoC which will fit perfectly in mid-range mobiles and Krait SoC´s have an advantage, integrated LTE modem which exynos will probably won´t have, I do not know about tegra because NVIDIA has bought ICARA so maybe if we are lucky it will support LTE. Krait will be destroyed? On what? Meaningless synthetic benchmarks? Android software runs flawlessly on the quad core Krait with the new Adreno; and it doesn't even break a sweat no matter what the task. It makes no difference whether one processor is twice as powerful as another if they both perform flawlessly in real life. I do not mean that S4 pro is bad or not enough, it is just that the now SoCs are going to be better. You can not stop evolution. It is the same with displays, we thought that HD is enough but now came FHD and nobody is complaining, this is evolution. If you have S4 pro now in your mobile you do not have to upgrade a few years. how about that cheaper quad core? its the first time that im looking forward on mediatek's new chip!